This Rubik's Cube has five rows on each side. Here comes the brain cramp! It's the perfect get-even gift! Looking for the perfect get-even gift for that super-intelligent, wiz-kid friend or coworker who thinks they can solve any puzzle and that Rubik's Cube is child's play? Give them one of these. It's got five rows on each side, for at least five times the challenge! 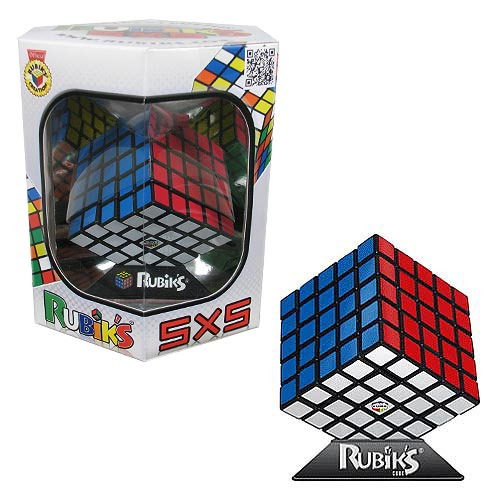 A crazy variation on the classic Rubik's Cube, this version includes a display stand and features thousands of ways to put it back together again. Are you or you pal up for the challenge? Here comes the brain cramp!